Portaging is the act of carrying a water vessel over land either between two bodies of water or around an obstacle such as rapids in a river. Photo credit. No copyright infringement intended. Prior to our meeting date the hostess asked if anyone would be willing to share a moment in our life where we had to decide what to bring, what to leave behind, and what insight we gained. I have had several significant times in my life, where portaging has been necessary ~ although I did not realize this is what I was doing. Through much trial and error I began to realize that I had to weed out the emotions and/or circumstance that could weigh me down making it difficult to move forward or…. from completely sinking. Determining what to put in the canoe differed with each journey/transition, and I wound up discovering there are three common things I always carry in my canoe. Support In order for me to progress I needed to put my ego aside and ask for help. I thankfully received a lot of love and support from my family and my circle of friends during these times. The various moves from one state to another, the new babies that grew into the challenging teenager years, the ups and downs of marriage, divorce, and death of loved ones became a lighter load when I asked for help. I had to decide if these transitions were going to make or break me When I was a 19½ year old newlywed my husband and I moved 800 miles away to southeast Texas. Leaving behind the only home I had ever known, as well as all my friends and close family ties, I was headed for a place I knew nothing about. I could have given into my feelings of loneliness and the almost eleven years we spent in Texas (with intermittent transfers to Baton Rouge, LA and Niantic, CT during this same period of time) could have been absolutely miserable. I am shy by nature so forcing myself to step out of my comfort zone was a huge and difficult step for me. I chose to make the best of it by attaining an undergraduate degree in education at the nearby university and got involved with a women’s club where I met and made some really great friends. We wound up moving back to my home state, and I returned a better person than when I left. I did some much-needed growing up, made life-long friends, and created some incredible memories. Faith I relied on my faith and the power of prayer to guide and help me through. I will share that there was a time during one of these transitions when I was extremely frustrated, worried, and felt so helpless that I had to step away from my prayer life because I felt my prayers were not being heard. Understand, I never lost my faith; I just had to step away for a while until I could make sense of it all. I never have made sense of it and I never fully understood the how and why of that transition; but I eventually came to realize ~ through the grace of God ~ how much that particular transition provided a positive influence in my tolerance of others, empathy for those struggling, and a deeper faith. In times of joy and sorrow I still rely heavily on my faith and although it is number three in this post, it is always the number one thing I put in my canoe. As the new chapters of my life unfold there will be more canoes to carry. I am grateful that I have, so far, arrived at each destination with more courage, resilience, and compassion than I ever thought I could. As I look toward the unknowns of the future, asking for help, deciding on whether I will allow this transition to make or break me, and relying on my faith will always go into my canoe. What do you include in your canoe? Bursts of laughter and lively conversation…. Book Club is something I look forward to every third Thursday of each month. We named ourselves REaD Threads and the story of how we decided this name is here. Simple, relaxed and informal we gather together to enjoy some delicious food and discuss the book of the month. Preparations usually include a list of discussion questions pertaining to the book, maybe some visual props, or plan an easy game. A few of our more creative members host unique gatherings. For example, one of the books we read was “Devil in the White City” by, Erik Larsen so the hostess shared memorabilia from the World’s Colombian Exposition held in Chicago in 1893. As we discussed the book we dined on some delicious Chicago style pizza and enjoyed a few treats first introduced at the fair such as Cracker Jacks and Wrigley’s Juicy Fruit gum. Another time we had a movie night where we arrived early and talked about “The Book Thief” by, Markus Zusak. Afterward we relaxed in comfortable chairs or stretched out on the floor with a pillow and a warm blanket in the hostess’ home theater room to watch the movie version while we munched on movie type snacks. One of our members was a brand new mom of two newborns and she was soon lulled to (much-needed) sleep by the soothing darkness and gentle musical soundtrack. Another time, one of the members invited the author of one of the books we read to our meeting and she accepted! That meeting was hilarious and is a whole other story in itself! Every year we select a different month or season of the year to host and February is my month. For the past two weeks, I busied myself gathering discussion questions, planned a quick word game and prepared a menu of appetizers. On the menu was a delicious Marinated Cheese Tray, artichoke spinach dip, stuffed mushrooms, assorted crackers, bread, nuts and homemade cookies. These are some of my “go to” recipes when I want to prepare something I know will get eaten up. Even though the weather outside was cold and rainy, it was warm and cozy inside. My book buddies (we have been together for nine years) did not disappoint with their thoughtful insights and unique perspectives. We, however, did our fair share of getting off topic and laughing so much our faces hurt! 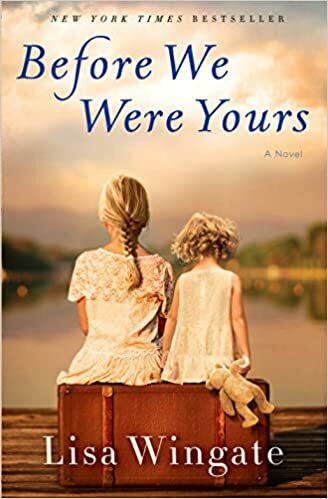 By the way, this month’s book is “Before We Were Yours” by Lisa Wingate. A historical fiction based on real events. It was an emotional and riveting read. Book club cartoon taken from this site. No copyright infringement intended.